This recipe batches up pretty well; it calls for an eighth of a watermelon, but you can pretty easily use the whole thing and just multiply everything else by eight. If you’re extra crafty, you can even serve if a hollowed out watermelon—which is just a matter of cutting the top of your watermelon and getting busy with an ice cream scooper. 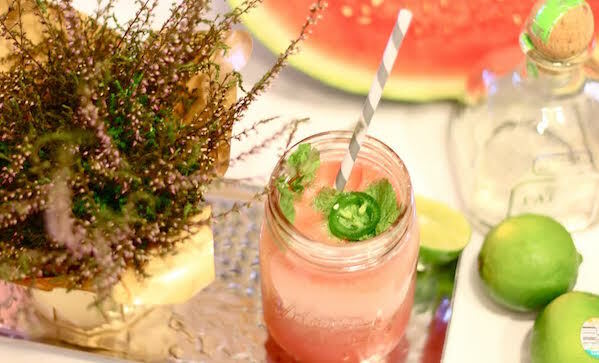 Add the watermelon, ice, mint, a few thin slices of jalapeño and a squeeze of lime into a strong blender. When thoroughly blended, transfer the mixture into 4 cups so that they are 1/3 full. Add one shot of tequila to each and top of with the Free Fresh Lemonade sparkling water. Garnish with mint and extra jalapeño rings.